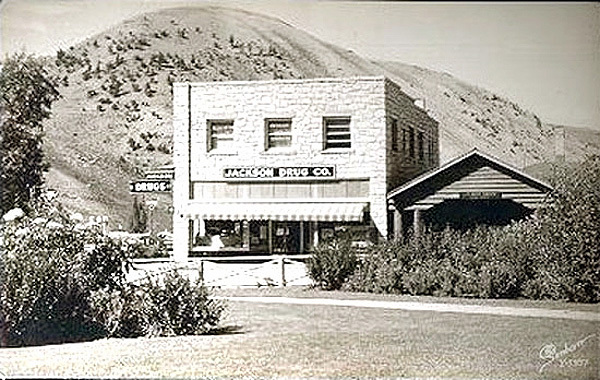 Jackson, Jackson Drugs, Teton Theater. Continued from previous page. 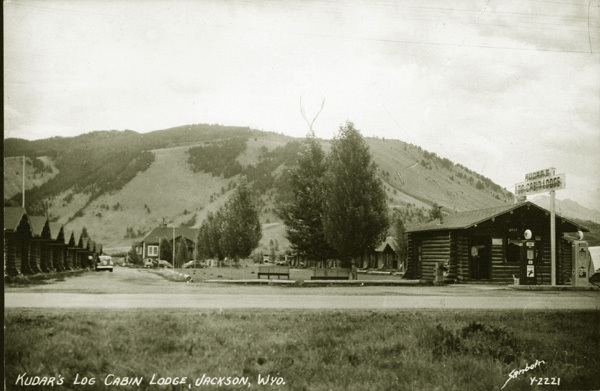 This Page: Jackson Drug Co., Teton Theater, Kudar's Motel. Abbie and Irmbrie Fishing tackle, The best Crane Stationery and tablets, Baseball Supplies, a full line of Drugs, Toilet Articles, Stationery, Eastman Kodaks, Kodak Supplies, Magnesias, Daily Papers, Cigars and Tobacco, Books of all kinds, Candy, Sundries, Manicure Sets, Jewelry, Post Cards, Souveniers, Nyal Face Cream and A.D. S. Paroxide Cream [The best kinds on the market] Wall paper Paints, Oils, Jap-a-lac, Varnishes, Alabasters in all colors, Glass cut to order, Glazing etc. We will take orders for anything and will send fountain pens and watches for repair. Fresh Fruit and Green Vegetables three times a week. "Jap-a-Lac" was a product manufactured by the Glidden Varnish Co. It came in natural or in "seventeen beatiful colors." The cans in which it came had a picture of the "Chap Chap" in the label. In 1920, Porter installed a soda fountain. Not to be out done in Kelly at the same time the Kelly Mercantile Company installed a soda fountain in the old dance hall. In 1922 Porter opened a movie theatre upstairs over the old drugstore. The movie theater was closed after two new theatres were opened about 1929. In 1933, Porter purchased on of the theaters the Rainbow. Jackson Drug Co. Soda Fountain, 1920.
. Porter constructed the top building in the photo in 1937 and moved the soda fountain to the new building. 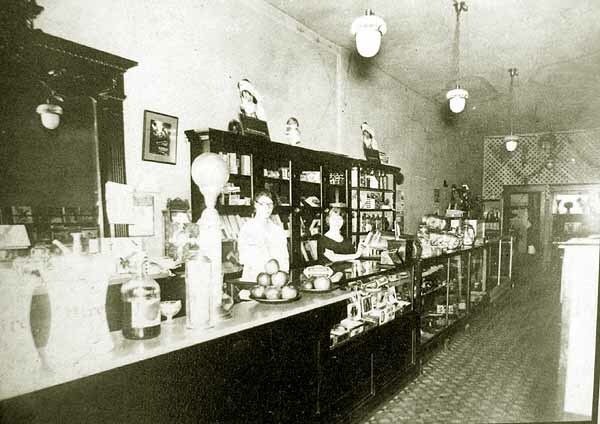 The soda fountain featured homemade ice cream which was made in the cellar of the building. The record indicates that Brazelton's motive for attempting to void the lease was to increase the rent from Jackson Drug, because the rent charged was lower than rents charged other businesses in the vicinity of Jackson Drug. We have the duty to sustain the legality of contracts fairly entered into if reasonably possible [citation omitted]. Absent overreaching, we will not aid one who discovers that he has made an unwise bargain in entering into a contract [citation omitted]. Brazelton asks us to do just that. We decline the invitation. Other than the Cowboy Bar, Jackson Drug was the last of the old time businesses on the square. It closed on October 31, 2001. As of 2013, the building is occupied by a trendy rug emporium. The soda fountain has been removed. 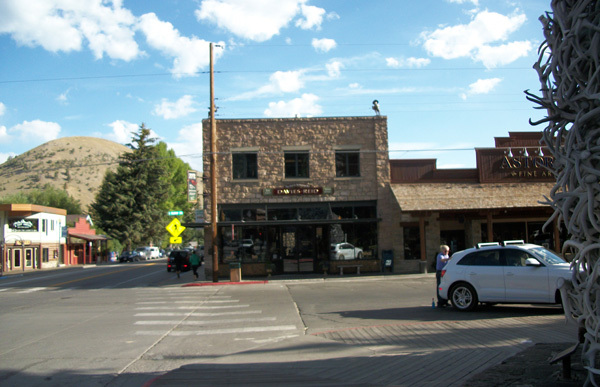 North of the drugstore at 120 N. Cache is the Teton Theater at 120 N. Cache also constructed by Porter with similar stonework. The stones for both buildings came from a quarry in Idaho. 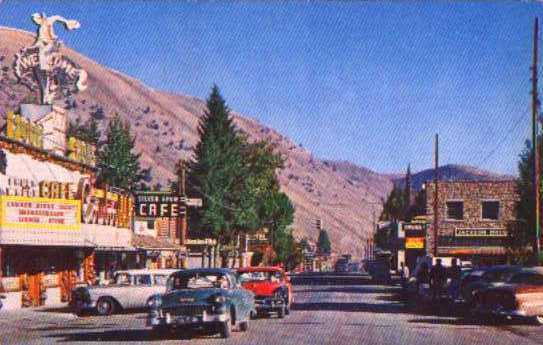 Teton Theater looking toward the intersection of Cache and Deloney. 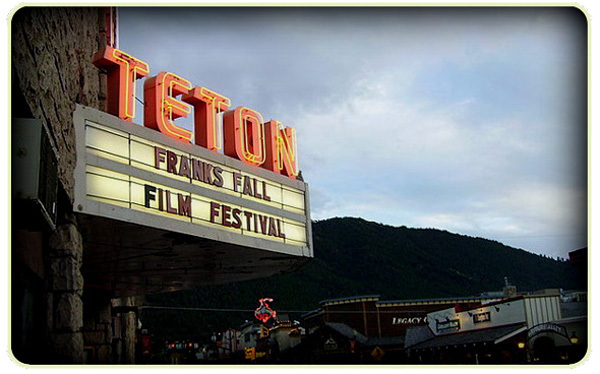 The theatre hosted the 1963 World Premier of the movie "Spencer's Mountain" filmed with the Grand Tetons as a backdrop. Photographs of some of the stars are on display in the Wort Hotel. Following the premier a party for some of the celebraties was held at the Million Dollar Cowboy Bar. Originally the theatre did not have a concession stand. Thus, patrons would purchase their refreshments at the drug store prior to going to the movies. In 2012 the Teton Theatre closed. Its last movie was "End of Watch." As of August 2013, the marguee still displayed a sign giving a telephone number for "Movie Info." Following the closure of the Cadillac Grille, discussed on a previous page, its liquor license was moved to the street address of the theater. This led at the time to speculation that the building might be converted to a restaurant. Frank's Film Festival has been moved to the Twin Cinema at 295 W. Pearl. Further north on Cache from the from the Teton Theatre is the Kudar Motel at 260 N. Cache. The Kudar Cabin court was sonstructed in 1937 by brothers Joseph H. Kudar, Sr. and Max Kudar and their wives Mary G. Kudar and Kate Kudar. The Kudars had moved to Jackson from Rock Springs in 1934. Kudar's Log Cabin Lodge. Approx. 1939. Photo by Wm. P. Sanborn. The trees in the next photo were planted by Mary Kudar. Mrs. Kudar lived to the age of 98 dying in 2007. 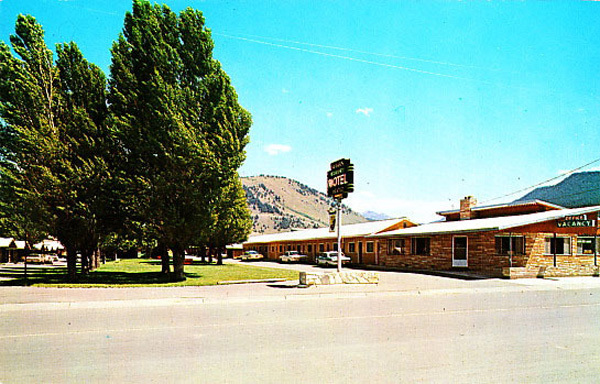 The motel is regarded by the Town of Jackson as a significant historical structure. Next Page: Jackson continued, Snow King Mountain, The beginnings of Winter Sports.